It’s full steam ahead for spring in Belgium. In Canada, spring swells the buds of plants and the hopes of gardeners many times before it actually decides to stay. Here, while the weather can be a bit bumpy in spring, the possibility of a foot of snow can definitely be excluded at this point - unlike in Canada. In the Leuven Kruidtuin, there has already been a change of guard. Crocuses and snowdrops are out, daffodils and early tulips are in. 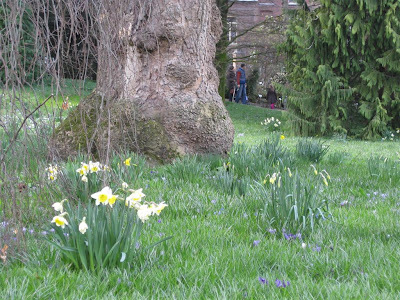 The big crocus lawn has been transformed into a lush, soft green field of crocus leaves, with clumps of daffodils. In the rest of the garden, rock garden plants are making the most of their early warming spot in the gravel and between big bolders. Furry Pasque flower (Anemone vulgaris) is blooming, and the Japanese maple in this location already has good sized leaves on it. It’s amazing how much earlier alpine plants bloom when grown at low altitudes. 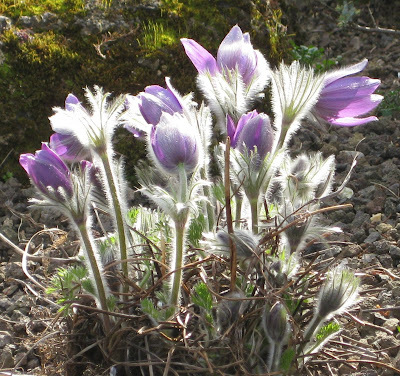 When hiking in the mountains, we might see the same Pasque flower blooming in June. 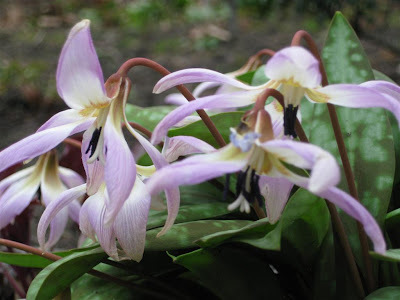 I even spotted a beautiful Erythronium (trout lily or dog's tooth violet - a North American native, but this one’s a hybrid) in the garden. I’ve been told that Europeans are much more appreciative of our native North American plants than we are, and as far as I can tell, there are definitely many of them in the garden, like Amelanchiers (Saskatoon berries), Cornus (dogwood) and Viburnums. One thing I've had to get used to in Belgium is not having my own garden. We're in an apartment, and while I have grand plans for container gardening on the balcony, it's not the same as getting my hands dirty in real soil. So, since we arrived here, I've been asking around for allotment gardens, eyeing abandoned land, and trying to find anyone willing to donate a patch of soil. What I found is something much, much better than I ever hoped for! Luckily for us, Tom also welcomes help in the garden. Although he's been growing things since he was twelve, he's not from a farming family, and starting his own farm would have been very difficult. Instead, he found out about CSA, and three years ago he launched the initiative with 80 members. Now he has many more, and has expanded to almost one hectare of land. It's a lot for one person to manage, so any help is welcome. Best of all, since he's not a 'professional' farmer, he doesn't expect you to have a lot of experience or always do things perfectly. On Saturday, we spent an absolutely gorgeous morning working 'on the farm'. 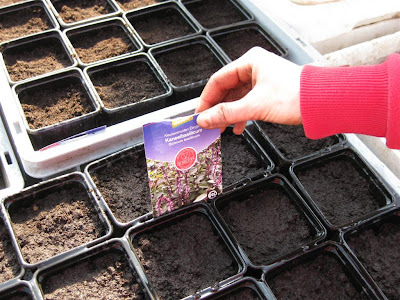 I planted herb seeds (3 varieties of basil, dill and some unknown herb - we're going to have to learn the Dutch names of vegetables fast!) and Steve got to dig out weed shrubs from the orchard. 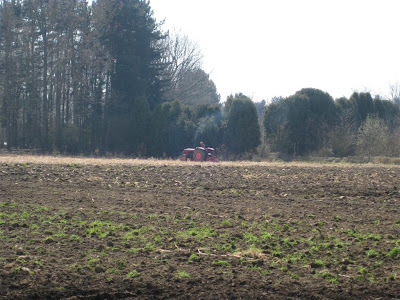 Meanwhile, Tom was driving around the field in his plant oil powered tractor. It really doesn't get much better than this. We're supporting somebody who really wants to be a farmer, we get to work on the farm whenever we want without being responsible for it, we hope to learn all about growing vegetables and farming, and all this while getting local, organic, really fresh and really good veggies. Awesome! Spring has arrived in Belgium! Shocking and wildly exciting for a Canadian not used to seeing anything green until May. And yes, now I'll have to rub it in like any other European. The signs of spring are everywhere - the air is warming up, the sun is gaining strength, fresh green buds are growing on shrubs, and of course lots of early spring bulbs are in bloom. 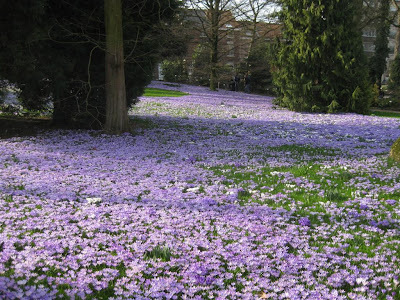 This post is actually already quite late - it was two weeks ago today that we visited our local botanical garden, the Leuven Kruidtuin (literally "Herb Garden" but used to denote botanical garden) and were welcomed by a field of crocuses in full bloom. That was March 1st! 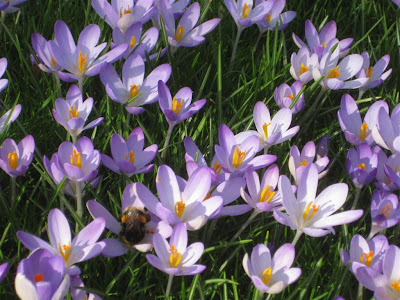 The sun was shining, the air was warm and the whole blue sweep of crocuses was buzzing with bees. Impossible not to feel the pure joy and excitement of spring. It was even nice to have the gardens filled with people - it felt like everyone was sharing in one great general enthusiasm. 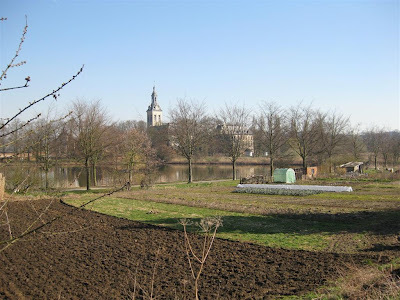 The Leuven Kruidtuin was established in 1738 and is oldest botanical garden in Belgium. It's not very large, but it has a little bit of everything: a large tropical greenhouse, formal gardens, wilder shrub gardens, a large pond and streams, an alpine greenhouse and alpine gardens, a fruit and vegetable garden complete with chickens, goats and bee hives, and a beautifully designed walled garden. Since it's a 10 minute bike ride away, there will definitely be many visits over the year and I'll post more about the various areas. 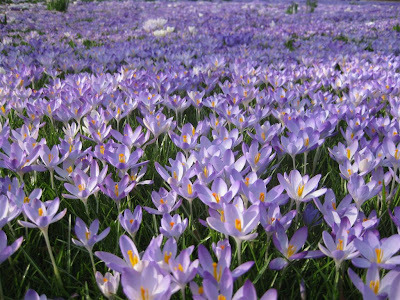 Right now, it's just about enjoying the field of crocuses and looking forward to all the bulbs that are soon going to burst into bloom. The daffodils are probably already out this week!!! 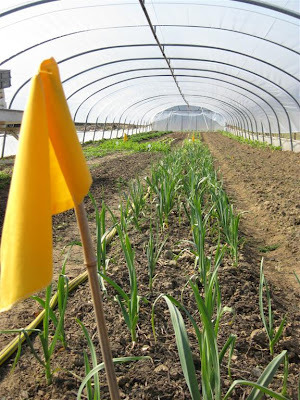 When: Season seems to start early March with bulbs, but garden, including greenhouses, are open year-round. Some parts of the greenhouse are only open Sundays. After my trip to Baltimore, I had to make a quick stop in Memphis for work. With little time to spare away from work, I managed to fit in a very short visit to the Memphis Botanic Garden. I was lucky to have great weather - 79F/26C at the end of February!- but it’s still not quite spring in Memphis. Some early flowering trees are starting to flower and it's daffodil season, but everything else is still waiting to leaf out. Given that I was just coming from freezing temperatures in Baltimore, it was incredible to just walk outside without a jacket, to enjoy the sun and the smells and sounds of spring. 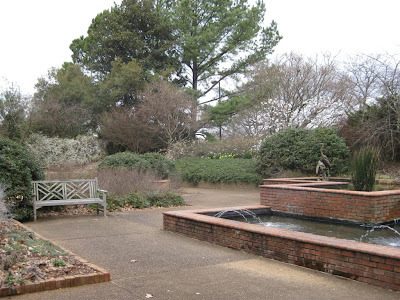 The Memphis Botanic Garden is quite large at 96 acres, although much of it appears to be classic grass and tree parkland. There is a complex network of paths throughout - the map available at the entrance is definitely handy. The first little garden pocket is the Sensory Garden (below). In late spring, the main sensory experience was definitely smell, with Loebner Magnolia in full glorious, very scented bloom. The Japanese Garden of Tranquility is next. True to its name, the design of this garden is very simple - definitely more about the overall design than plants (although early spring may not be the best time to judge). Across the lake from the Japanese garden begins the woodland garden. 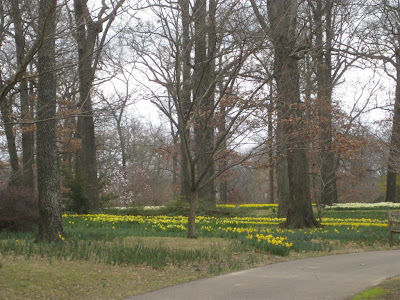 This was the most spectacular portion of the Botanic garden at this time of the year: wide drifts of yellow and white daffodils covered the forest floor. There’s probably nothing quite as cheerful and uplifting in spring as a massive carpet of spring bulbs, but I think they are most effective when covering a large area - not always the most practical in a regular city garden. It's also best to stick to one kind of bulb or colour theme to really make a big impact. 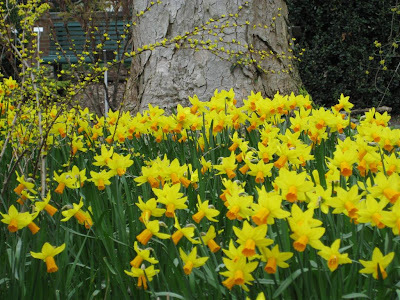 Many bulbs, including daffodils, naturalize, meaning that once you plant a few bulbs they’ll keep multiplying and filling in an area. Daffodils are quite slow however, so a lot of bulbs are needed to get them off to a good start. 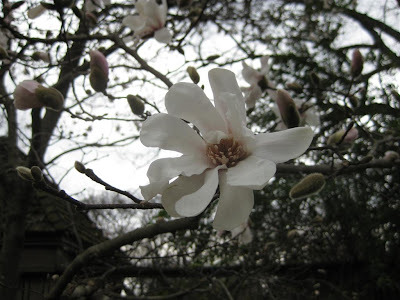 Several magnolias were also waking up in the magnolia walk - I bet this will be a lot more spectacular later in spring. Two Cornus Officinalis were also in spectacular bloom. 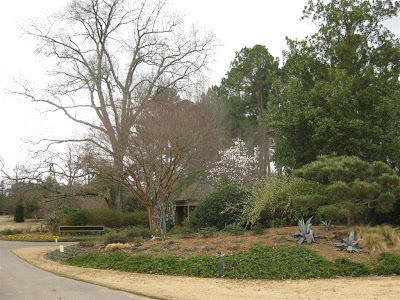 Although it’s hard to tell this early in the spring, the Memphis Botanical Garden certainly seems worth a trip if you’re in the area. They have many gardens with something in bloom most of the year, and are just expanding a children's area this year. Where: 810 Cherry Rd, Memphis TN [Map]. Unfortunately, Memphis is definitely car-oriented, so there is no good public transportation to the gardens. When: Season starts in late February with bulbs and early flowering trees, and continues to November. 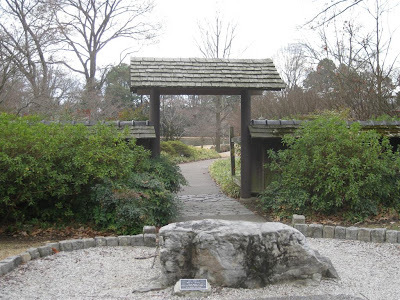 Check the Memphis Botanic Garden website for the month-by-month bloom schedule. Whenever I travel to a new city, my first sightseeing priority is usually the botanical garden. I recently had to travel to the US for work, but February is not the best time of the year for touring gardens in Baltimore, Maryland. Luckily, I found out I could still get my gardening fix at the Baltimore Rawlings Conservatory. One of the few remaining Victorian conservatories in the world, it was built in 1888 and designed by architect George Frederick. 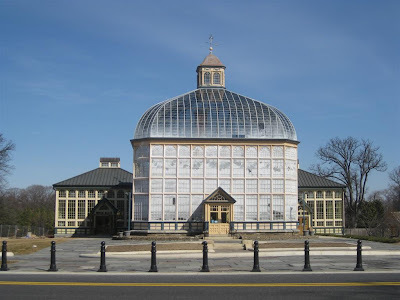 The original Palm House has since been expanded with the addition of several greenhouses and outdoor gardens. Having read about it, and being excitable by nature, I was pretty eager to see it. Unfortunately, I expected a bit too much, so it was somewhat of a disappointment. Everything is very neat and well maintained, but very small. 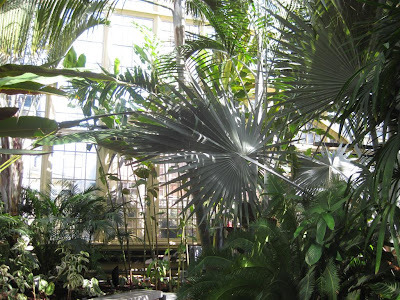 The original Palm House has some nice palms (15 species), several of which are quite large. A small orchid room connects the old conservatory to the three new greenhouses, each of which has a different theme. The Mediterranean house is filled with silvery, small leaved plants and shrubs, and the overwhelmingly strong fragrance of rosemary and scented geranium leaves. 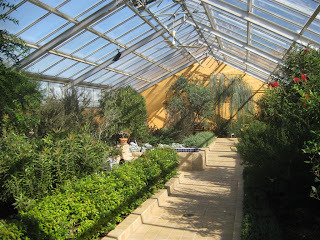 The greenhouse is completely unshaded, so on the day I was there the plants were basking in glaring sun - very Mediterranean. Next up is the Tropical house, definitely my favourite. After the stark sun of the Mediterranean house, the shaded, humid Tropical house with big leafy banana and papaya trees was a relief. 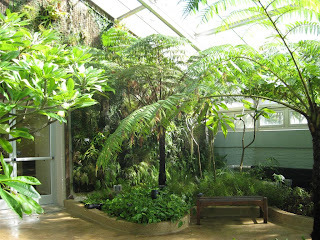 I especially loved a corner with three giant Australian tree ferns. 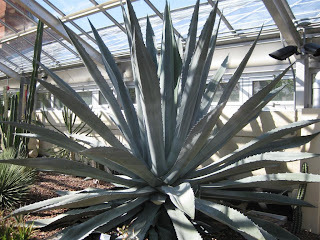 Next is the Desert greenhouse - not really my favourite habitat, but the giant American agaves were really stunning. Overall, the Rawlings Conservatory is quite small, but well taken care of and arranged to really showcase the differences between very different habitats. Going from small leaved, shrubby and silvery Mediterranean plants, to giant-leaved, rich green plants, to prickly cacti really makes one appreciate the incredible versatility of plants. Worth a trip if you’re in Baltimore, but certainly not a special destination. Where: 3100 Swan Dr. in Druid Hill Park Baltimore, MD 21217 [Map]. Best accessed by car. The Baltimore Metro Mondawmin station is a 10 minute walk away, but it’s not in the safest of neighborhoods. When: Greenhouse is open and can be visited year-round (Tuesday-Sunday, 10am-4pm). The surrounding Botanic Gardens appeared to be more park than garden, but this might also have been due to the time of year (February).